Oh, you film bathing beauties! Likewise, a what ho! or two for the Venice mermaids, also what to tell! This is to warn you that if you would a-bathing go at any of the municipal swimming pools you must leave your gay and abbreviated bathing suits at home, for the Playground Commission, with the Council's connivance, has issued a Puritan pool edict. In other words, if you, this is only for feminine ears, would swim anywhere within the purlieus of Los Angeles you must hide your charms with a skirt that isn't diaphanous. "Oh, yes," said Supt. 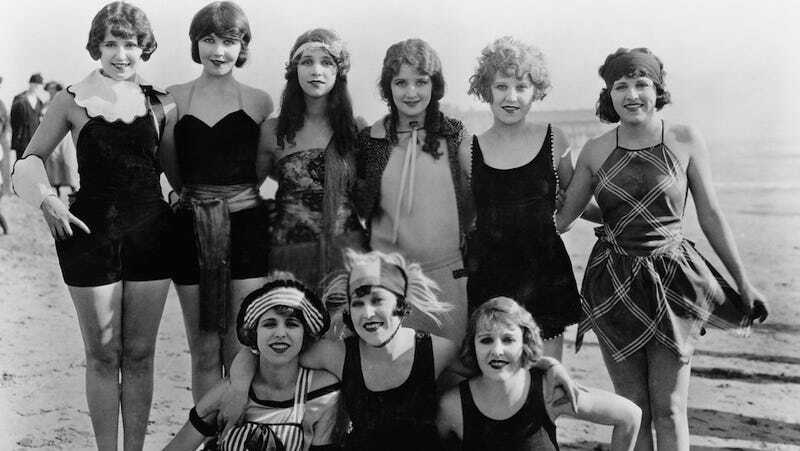 Raitt of the Department of Playgrounds, yesterday, "we are turning back young women who would bathe in the city pools in suits that — ah, ahem — we, you know — suits that would be all right perhaps at Venice or Atlantic City but — well, we cannot permit them." Venice and Atlantic City: Constant safe havens for thigh-baring floozies.